Cliff, an IT Director was concerned. One of the projects was a mess. It didn't seem to matter how much or how little the team had for requirements. The team never seemed to release enough on time. Cliff had only been with the organization for four weeks. Yet, that team seemed to have more trouble than any of the other teams. He finally felt as if he had the trust of the VP and had figured out—at least a little—how to get things done here. He'd just returned from meeting with Sandy, his VP. Sandy was frustrated and was ready for him to fire everyone and start with a new team. Cliff was pretty sure the team wasn't the problem. He needed to understand what the problem was, and fast. He decided to create a picture of how the team worked and where they had trouble. He asked the team members to gather in the meeting room at 3 pm that day. Ellen nodded. So did everyone else. Ellen sighed. “Are you going to fire us?” she asked. Cliff went to the whiteboard. He put a sticky marked “T5” at the right end of the whiteboard. He wrote “Deployment” above the sticky. Cliff said, “Wow, this is worse than I thought. You do have a system problem. You have several system problems.” He wrote T4 on a sticky and labeled it T4. He put it to the left of the T5 sticky. The team graphed the rest of their project's process. It was worse than Cliff had expected. The beginning of the process was okay. The VP and Cliff's peers decided which projects to do at T0. The team received the project at T1. 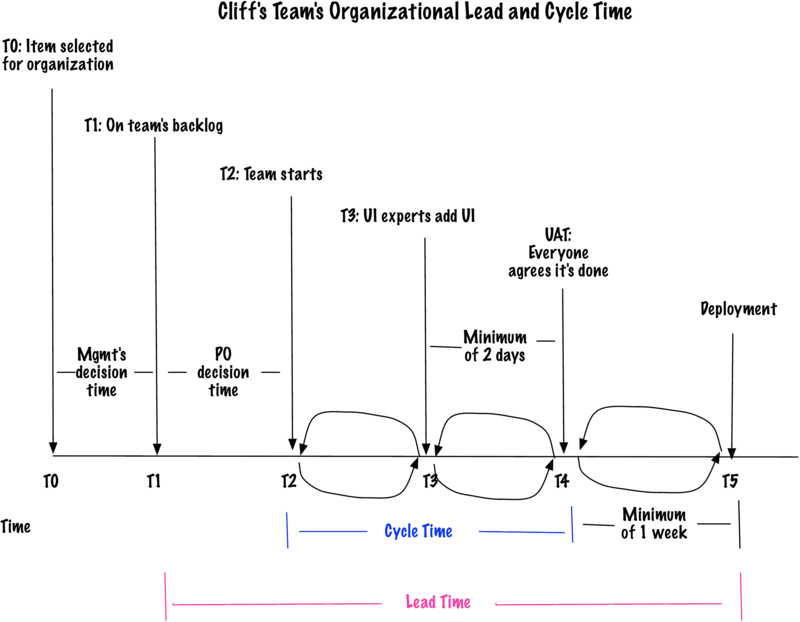 Cliff wrote “Mgmt's decision time” between T0 and T1. Cliff whistled. “That's a long time,” he said. The team explained they weren't allowed to do any UI by themselves. They had to go to the UI group and ask for people. Because their project wasn't as important as other projects, they got new people all the time, who didn't understand their project. The team iterated with the UI folks, which wasn't horrible, but it wasn't the same people all the time. They had to ask every time they needed a UI person. “Have you measured your full cycle time?” Cliff asked. The team and Cliff discussed options about who was open to working with him and the team, and who the team had had trouble with in the past. Cliff took a picture of the whiteboard as a basis for discussion with Sandy. Cliff made an appointment with Sandy for the next day. He brought his picture of the chart, cycle times, and lead times over the past three months. Once Sandy realized what was happening, he demanded a meeting with all of his directors to solve the problem. I have yet to meet a team that didn't want to succeed. Often, the system, the way things work in the organization, conspires against them. 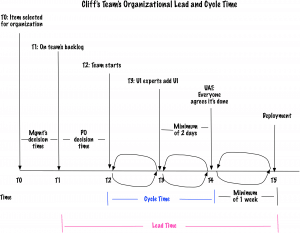 If you have delays in your system, consider a chart like this so you can measure your real cycle and lead times, and show people where your delays are.